On July 19th, Be Like Ada will host 500 high school girls for a full day coding bootcamp. The girls will spend a day learning the basics of coding and the elements of code fundamentals for any programming language. 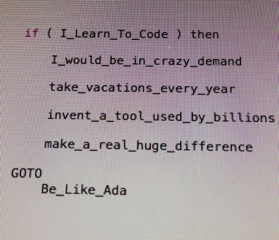 Be Like Ada (named after Ada Lovelace, the founder of scientific computing) is for girls new to or somewhat versed in programming. They’ll learn how to think like a programmer and learn real code. What You Will Need: Bring a laptop and power adapter, any laptop made after 2010 should work. Browsers supported include Chrome 13+ , IE 10+, Safari 5+ (Mac OS X 10.7 or better), FireFox 4+. Lunch will be included, some parking is available. In Canada there are less than 20% female engineering undergrads. Canada is also facing a shortage of software engineers. Soon most jobs will require an understanding of programming. Unfortunately, programming is often not promoted to girls nor taught in girl-friendly environments. The Be Like Ada bootcamp will be fun and show relevant applications. The 500 girls will be presented to female role models and have the ability to build peer-to-peer connections with the other girls at the bootcamp. Be Like Ada was the brainchild of Jot Kali and Sandra Wear. Together, they aim to get 50% female engineering undergrads and two times the number of engineers within Canada. 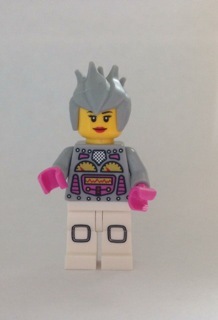 Sandra told me that Be Like Ada will combine a physical approach to code (with LEGO as learning tools) with the fundamentals of programming with Python. Her goals is to fuel and enable girls’ engagement through this bootcamp, continued online engagement and future after school programs. Soon girls will be able to have the option of coding after school along with Girl Guides, sports, and other existing activities. Personally, pulling websites apart to see what made them run was how I got into basic coding, and how I learned to not only make my first website in 1997 but also build a WordPress theme development company 6 years ago. Learning code was one of the most important things I did to further my career, and to create one in the first place. Going beyond the coding of a website and learning how commands make things run, from an app on your mobile to a program on your computer, is such a valuable skill. Registration is open now for Be Like Ada in Vancouver on July 19th. Follow Be Like Ada on Facebook and Twitter for more information.